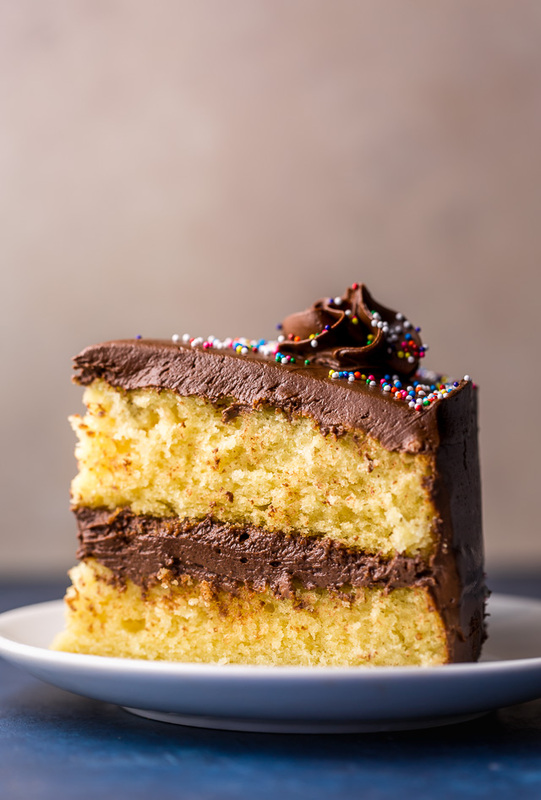 This Classic Yellow Cake with Creamy Chocolate Frosting is so easy and sure to be your new favorite! The layers are moist, buttery, and flavorful, and the creamy milk chocolate frosting basically melts in your mouth. 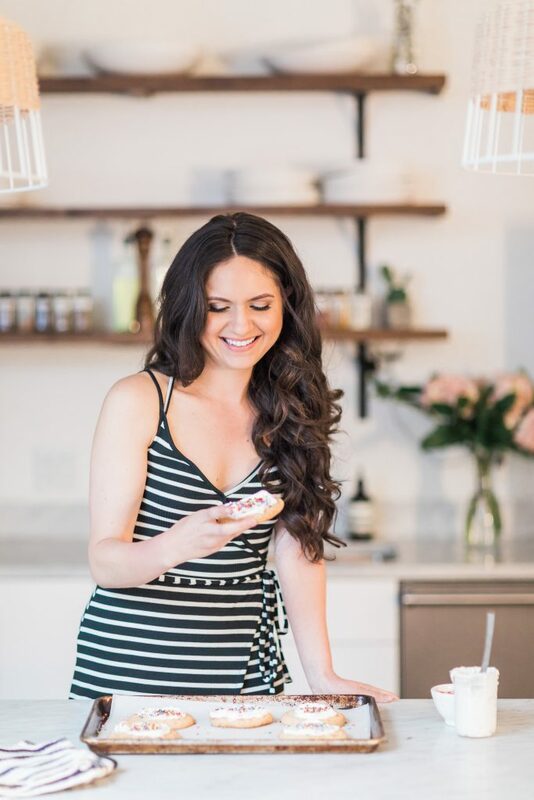 This is the kind of recipe you want in your back pocket for birthday parties, Summer picnics, and everyday celebrations. The cake itself is supremely moist, but to me the flavor is the star of the show. It’s perfectly sweet and buttery, with subtle hints of vanilla. And the creamy chocolate frosting only sweetens the situation. Because I’m a sucker for nostalgia, I love decorating this cake with colorful sprinkles. But fresh raspberries make an equalLY stunning garnish. So you definitely have options as far as decorating goes! I tested this cake recipe in cupcake form and unfortunately did not love the results. However I found it worked perfectly when baked in a sheet pan! So if you’d like to do that, feel free! Just add about 7 to 10 minutes onto the bake time. Because we want the moistest cake possible, this recipe calls for cake flour. Cake flour is extra finely ground and gives the cupcakes their extra soft texture. In most grocery stores, you’ll probably find cake flour in the baking aisle. You can also buy it online here. When you measure your cake flour, be sure you’re not packing it into the measuring cup. Packed flour will yield dense and dry cake. I use the spoon and level method of measuring. Before you begin baking, make sure your butter, eggs, and milk have all come to room temperature. Cold ingredients do not bond! You’ll want to use quality chocolate for the frosting, such as Lindt. I don’t suggest using chocolate chips. And of course, be sure your cake is completely cooled before frosting! 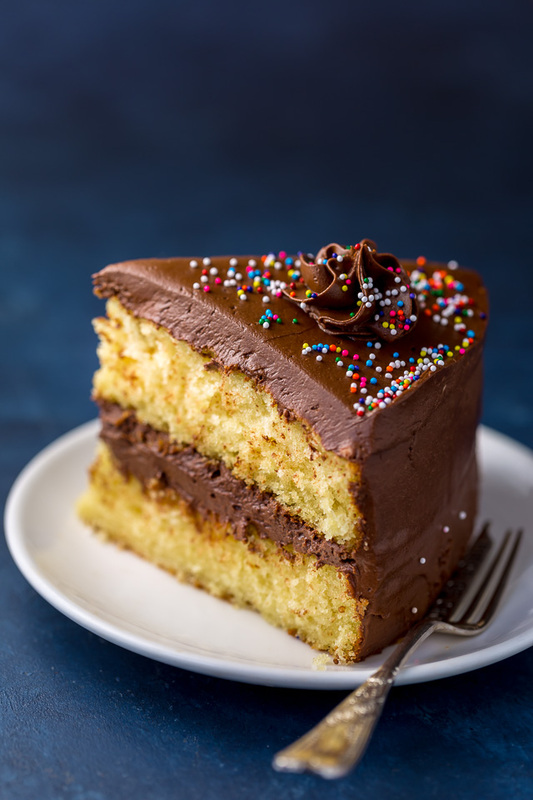 If you’ve been searching for a Yellow Birthday Cake Recipe that’s moist, flavorful, and made with simple ingredients, you have to try this recipe! 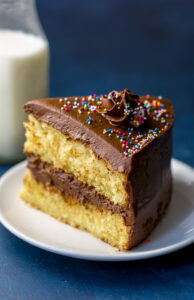 This Classic Yellow Cake with Creamy Chocolate Frosting is sure to be your new favorite recipe! Preheat oven to 350 degrees (F). Grease two 9-inch round cake pans and set them aside. In a large mixing bowl, combine the cake flour, baking powder, baking soda, and salt. Set aside. In the bowl of a stand mixer fitted with the paddle attachment, or in a large bowl using a handheld electric mixer, beat the butter on medium-high speed until creamy, about 1 minute. Add in the sugar and beat until light and fluffy, about 3 minutes. Beat in the eggs and egg yolks, one at a time, beating well after each addition and scraping down the sides of the bowl as needed. Beat in the vanilla. Turn mixer off for a moment. In a glass measuring cup, combine the milk and lemon juice. With the mixer speed on low, add the flour mixture in three additions, alternating with the milk mixture in two additions, and mixing just until the flour is incorporated. Do not over mix here. Divide the batter evenly among the prepared pans and smooth the tops with a rubber spatula. Bake for 25 minutes, or until the tops are golden brown and a toothpick inserted in the center of a cake comes out clean, or with moist crumbs attached. Cool the cakes in the pans on wire racks for 15 minutes. Invert the cake layers onto wire racks and cool completely. In the bowl of a stand mixer fitted with the paddle attachment, or in a large bowl using a handheld electric mixer, beat the butter on medium-speed until completely smooth. Reduce the speed to low and gradually add in the confectioners' sugar, beating until all of the sugar is completely combined. Add in the chocolate and beat smooth. 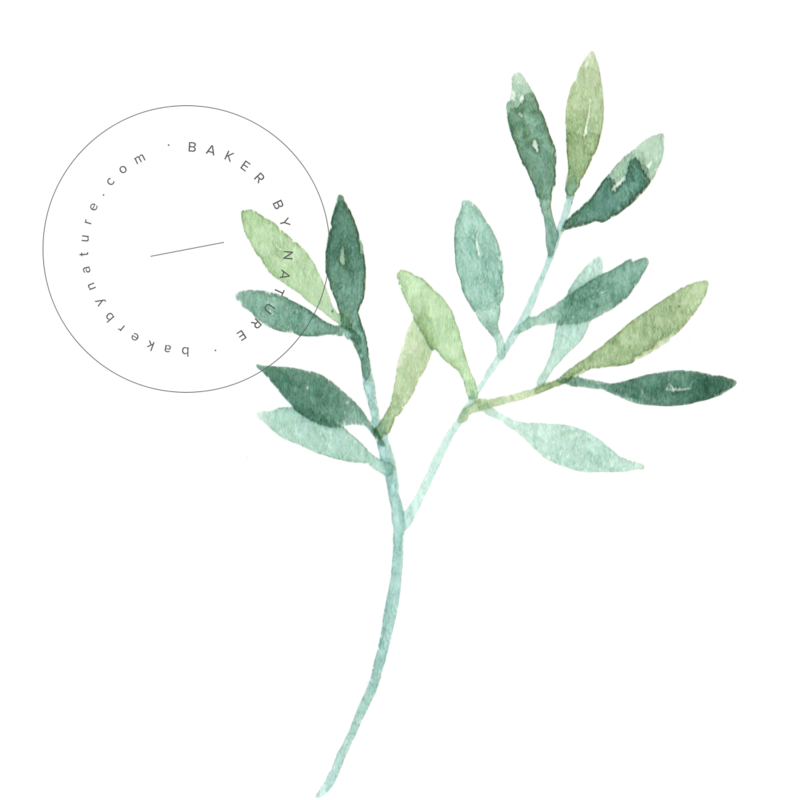 Once all of the ingredients have been incorporated, increase the speed to medium-high and beat for a minute. Whole milk? Is it homogenized milk? This looks great. Do you have the measurements in grams by any chance? Also are you using an electric fan oven? Can fat free milk he substituted? I just used this recipe. It is pure perfection. Everyone is raving about my cake year for Thanksgiving 🙂 However, I couldn’t find cake flour so I ended up using all purpose instead. The cake still turned out super moist. This is a fail-proof recipe! Thank you for sharing this! Do you know why cupcake recipes don’t always translate to cake recipes? Thank you for any help! Does this neee 5 eggs total? You wrote 3 eggs, then 2 eggs? Wanted to know the use for lemon juice. Will it not alter the taste? I’m wondering the same thing. I don’t want it to taste like lemon at all. Although I’m not 100% sure for this recipe, typically milk mixed with lemon juice or vinegar is a substitute for buttermilk. Is frosting made with baking chocolate or maybe a bar or so of Godiva?